In my search to determine what people actually mean when they say they want a “comfortable life” and in particular a “comfortable retirement” I have come across two conflicting definitions. No wonder, then, that such statements confuse me. I usually think that comfort means being free from physiological (mental and physical) pressures or stresses. For instance, there may be less stress associated with sitting in a certain chair. What I did not understand why anyone would go to such great lengths and engage in work that was clearly stressing them out to sit in a chair that was mildly more comfortable but caused a disproportionate level of stress, that is to say, the marginal utility of upgrading the chair was lower than the marginal cost of adding one more year of work. However, there is another definition of comfort which is founded on contentment and general life satisfaction. Uh oh, that’s a slippery slope right there because it is subjective to all sorts of external fads and fashions. By this definition we would only consider ourselves to be comfortable when we are satisfied. However, wants are supposedly infinite, at least, you know, the material wants, as I note that wants to get off our asses and exercise seem to be fairly limited, and this means that those wants can never be quite satisfied. They always grow on top of a moving baseline which in the worst case is defined by what everybody else seems to want (keeping up with the Joneses) and in the best case is defined by what you want. This means that a person can never be quite comfortable in this frame of mind. Being comfortable based on such wants actually turns out to be a stressor and the usual argument (which I have been asked is): Well, you’d like to own a boat, so wouldn’t it have made sense to work one more year, then you could have bought a nice boat instead of cheap fixer upper(*). I could have done that, but maybe then, that boat wouldn’t have been enough. Maybe I’d also have wanted a nice truck, so that’s one more year on top of that. Since trucks wear out, I’d need to make sure that I had money to replace it when it wore out in 12 years, so add a third year. And so on. (*) I haven’t bought one yet, but I’m looking. “Just one more year and I would be able to retire in comfort”; except that’s what I’m telling myself every year and meanwhile my salary and responsibilities keep increasing and it becomes harder and harder to let go and then at age 48 I get a stroke which leaves me without control of the right side of my body, but not everything is lost, because I can always spend the boat and truck money on meds. Some more comments: Maus makes some great comments below, so I figured I’d respond to them in the main post. The first issue is the safety or income factor. First people seek a 4% withdrawal rate to cover their expenses because 4% has been shown to survive worst case scenarios over 30 years. Then they seek 3% just to be safe which is a 33% margin. Then the target changes to 2% just to be a bit safer even though this is actually a 100% improvement compared to the original case which means that in the historically worst case they’d end up with millions of dollars they can’t spend. Heck, even I will end up with a million bucks in my fifties and several millions by the time I die simply because I saved too much. The only danger would be to suddenly double one’s spending but I figure as I learn more and more and adapt an increasingly sustainable lifestyle my spending is more likely to go down than up. There is only so much safety money can provide, so working to accumulate more money to provide more safety is irrational. If, say, the country gets hit by hyper inflation it does not matter too much whether you have $500,000 or $5,000,000. The marginal safety provided by money is decreasing. If I wanted ultra safe, then, I would create a stash with a 50 year supply of toilet paper, etc. and put a guard on it. That’s safe. Still, that does not eliminate the other safety issues like getting cancer (it also happens to vegans, just not as much), or getting killed in a freak accident (falling toilet seat from the sky). The poverty of imagination is another great point. It amuses me that so many people say they’d still be working at their job even if they didn’t need to…you know, the passionate ones… do you really mean to say if you had these hundreds of other opportunities to do other stuff, you’d still pick your job of all things. I think many think there’s little alternative to their jobs other than sitting at home watching their DVD collection twice over, then going out to eat at every restaurant in town and then what? … Imagination is important but unfortunately, the imagination available for sale is pretty expensive: vacations, resorts, exotic activities, … There’s no need for that. Learn to play the guitar. Restore a classic car together with other people interested in the same thing. Meetup.com is a good place for this. Join a drinking club with a sailing problem, you know, a yacht club, or a coffee club with a biking problem. Personally, I have scheduled activities 4-5 days a week and that’s certainly enough for me. Sometimes it’s even too much. next post: How rich do you really need to be? 46 users responded in " One more year before comfort "
Jacob, I think there is a third aspect of comfort that induces the “one more year of work” syndrome you address here; and your last paragraph hints at it. People find comfort in storing up resources to stave off fear of the unknown, e.g. a stroke at 48. But more money is a poor, and often illusory, bullwark against the unknown future disasters that might strike. It is difficult for someone to calculate the marginal utility of saving for the heart attack or cancer that might occur ten or twenty years from now. Will any amount of money really suffice? And for others, the very idea of “comfort” as a goal is off putting. I love to read, but the idea of retiring now only to have 8-9 more hours a day to read does not entice me. In this case, I suffer not from a poverty of funds but from a poverty of imagination; since I have so few ideas about what I’d do if I weren’t practicing law. The marginal utility of the latter is certainly diminshing with each passing year, but not yet enough to tip the scales toward unfettered free time. As a mid-term goal, I’ve got to come up with one or two compelling replacement activities. I’d love to hear more on this as I have seen this first hand with my DH. He’s a former pro athlete, healthy, easy going etc, but his success on someone else’s terms has caused visible health issues and if you do not have your health…what do you you have? I am all for working (you yourself work Jacob, but on your terms which rids you of the stress, correct?) but for the sake of productivity not to get a stroke at 48. There’s a similar creep trap when buying computers — especially for those who like to put their own together from parts. For $25 more, you can get another 100mhz. But once you spend that $25, you get the same choice again and again until you finally are paying the nosebleed prices for the nosebleed technology. The most important part is being honest with yourself about what you want your retirement to be like. That is not an easy question for most people who retire at 65 and I suspect it’s an even harder question for those seeking to retire early. Once you know what you want, you can work as long as it takes to get you there. And since you know what you want, you know when to stop. I loved this post but then again I envy your life. You have taught me so much about searching for my own dreams and looking for alternative ways. I try and argue the point of retiring to have a life instead of retiring to stop life but always seem to lose! I guess because I’m argueing with people who think eating in a Name Brand resturant and taking cruises to “see” the world (don’t all ports look pretty much the same? )is the ideal life. I want to learn the piano, join a book club, hike the mountains around my home, live for 4 months a year in the country side of Mexico (we are buying property there by my husbands family). We are now debt free and I need to learn more about investing so look forward to your future post. @Tina B – Marinas pretty much look the same, I say, based on the my observations of 3 different ones 😉 , namely, like a big parking lot with a break water in front. I think what matters to these types is not how things look or what one finds there but how exotic the name of the port is? Indeed, it completely depends on what one wants out of retirement. For example, I have heard there’s some tension between cruisers and charterers in the BVI (very popular area in the Caribbean); specifically, the charterers go down there for 1–2 weeks of partying and pay thousands of dollars per person for the privilege and then they fly back to their jobs. They don’t like to learn that there are people anchored across the bay in their own boats who stay and spend the same for the same view and water _annually_. I suppose that kind of knowledge is “uncomfortable” in a sense. If there is not already a band with the name “Toilet Seat from the Sky”, then there should be. One more year… well, I only wish. The biggest trap I’ve found myself in is that of the pension terms — I (or a surviving spouse) can only get my full benefits if I reach age 58 and declare retirement. Well sure, you say, just pile up enough cash to exit the workforce whenever you want. Heck, I do believe we could change our lifestyle enough to do so, but then there’s another snag in the pension terms. If I exit employment before age 53 (e.g. 5 years before retirement age), then the interest on the retirement benefits stop accumulating. Note that this isn’t the same as vesting. I’ve been vested for 10+ years now. It’s just a rule that keeps you working so you don’t have reduced benefits! Now if I’d understood the gravity of this second part of my pension rules, I would have arranged my career and life slightly differently 6-7 years ago, before passing the point-of-no-return regarding these benefits. The old idea of retirement is dead – it’s better to go the “Tim Ferriss” way (which in some senses is also the ERE way) and just take many mini-retirements (for lack of a better word) along the way. Work in bursts – earn some money, then take a break. Or, combine that with some streams of investment income to smooth out the income chunking. It can take a long while to build up your dividend payments in the beginning, but the benefits accrue in a magnifying fashion on the other end (in the future). The longer you hold your div-paying stocks, the higher the effective yield on each purchase becomes. Another great reason why it’s better to invest as much as you can earlier rather than later (assuming you’re in the right stocks, that is – solid dividend growers). @MoneyEnergy – Another word for miniretirement is temporary unemployment. The strategy is similar to what a contractor, a consultant, or a freelancer may pursue. Also see Charles Long’s Living without a salary. Great post. I’ve never really thought about the possibility of retiring early. However, this post made me ask if I really want to be saving everything in retirement accounts or regular accounts just in case I decide I want to live of my income sooner. Hmmm. Thanks for the food for thought. I just realized this is the same trap people fall into when they think they are “ready” to have a baby. At some point, you have to trust your preparation and just go for it. This post finally put a name on the issue I believe is preventing most people from pursuing early retirement. Poverty in imagination. Many people I speak to are terrified of retirement, even more so retiring in their 30’s unless they have close to an endless supply of money. While I am not one to have many great hobbies I truly don’t believe I would have trouble with retiring by 37-40. As it stands right now 51 is probably more likely. Jacob, it would be interesting if you one day posted your schedule for a month, just documenting how you pass time and which type of activities you do (beyond sailing, practicing fencing and writing your book). @Aniara – That’s a good idea with the schedule. I believe I have done a post on that already though (between Apr09 and now). It will probably be more interesting once I get the book out. Right now my schedule looks exactly like it did in grad school except I’m sitting at home rather than in an office. I get up at 9a. Check the markets. Do the blog maintenance. Then I read “randomly” (books and net). If inspiration suddenly strikes I fire off a blog post. Around 4-5p thoughts start to condense and I can write something for the book. DW comes home at 6p and I make dinner. We walk the dog around 10p. DW goes to bed around 11p. Then I enter my most productive hours and write/edit until 2a and then I go to bed. @Craig – That’s where I was about five years ago – then I realized that I was just investing unconsciously for “some day in the distant future” and not taking any of the benefits now. It pays to be conscious about the life/value trade you are making on a day to day basis (weekly, monthly). I’m not the expert here but am working on it. The point of setting aside cash (saving, investing) isn’t to make a nice big pile for 30 yrs down the road – it should be for the streams of income the cash can provide you – and the sooner you can live off it the better, probably (continue to diversify, of course…). A drinking club with a sailing problem – where do I sign up!!? Jacob, I am going to hit my 4% early retirement number before I’m able to retire for other reasons. My options as I see them, then, are once I have my 4% number and am still working: (1) keep saving for my 3% or 2% number, which would feel like “one more year before comfort” and depress me; (2) start spending like an average person on middle-class luxuries, which doesn’t interest me much; or (3) spend the money I usually saved (about $25k a year) on other people, charity, gifts, local artists, pay off friends’ loans, etc. That sounds fun to me, to be my own foundation, sort-of. 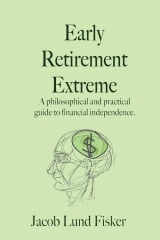 I’d really like to know if any of your readers have been in the position of having saved their early retirement nest egg but continued working, and what they did with the % of their salary they were saving before, especially if they decided to begin spending it one way or another. Thank you and sorry this was long. @Ruth – Whatever income I made after 4% was saved to decrease the “4%”. My portfolio is now in a runaway mode since I withdraw less than what it has historically done. I never saved it for safety though and I am really picky about what I work on now. If I had kept working “for comfort” I could have been a millionaire in my late 30s which although it’s a nice score was not all that important given that I can’t/won’t use $30-$40k a year just to live. However, it still bugs me that some have saved more than me 😛 It’s pure competition and it’s really quite pointless and not something I’m proud of. I’d even consider it something of a disorder or maybe just a bad attitude. In any case, I’d like to thank you for the information you provide and it inspired me to blog about my road to financial independence too. Even if it’s just to inspire other people who try to walk the same path. I(52) am at “one year out” as of the end of next month. My husband is out completely next month. I want him(59) to be settled in the “drinking boat club”(we live 1/4 mile from the lake) before I leave my position. We both have taken several mini retirements- some as long as six years. This looks much more like the real thing. The house is mortgage free and the garden is in. No real magic number- it is simply time. Our last tax bill sealed the deal! I know we are not as young as you- but we have no intention of writing a book or blog. I am looking forward to the “next retirement”. We know how to travel and live other places—but will the dogs be able to adjust???? “wouldn’t it have made sense to work one more year, then you could have bought a nice boat instead of cheap fixer upper”: depends what your priority is: owning something fancy, or doing the actual sailing. Jacob- thank you so much for this post. I really appreciate your posts that talk to the issues of people who are awfully close to having the assets. It is something I struggle with. I follow the YMOYL charting strategy, but unfortunately I don’t live in the place I plan to retire, so I don’t know what my actual needs are. This allows me to entertain thoughts like – well just another 100k or 200K just in case, but I have a feeling that when I get that extra 100k then I’ll want just another 100k. Enough is such a tricky elusive place. Jacob, Great post as usual. @ApW – Routine? I don’t really have any. I do what I feel like. I’m not really aiming for productivity-mentality of things I have to get done that’s not work i.e. the way career people do vacations with a schedule rushing around to see things. I get things done in spurts. So lately (in March 2011), I’ve done taxes, made a sewer hose holder out of wood (with a mortise and tenon joint), carved a wooden sword, bid on camping gear for a trip to Yellowstone in two weeks, and got a wisdom tooth pulled out. Forgive me but how does job you love = failure of imagination gel with you going back to work? @David – It would prevent confusion if you replied to comments on the same post as the original comment. What I said was that your failure of imagination prevents you from acknowledging that working [on a job you love] is an option for someone who’s financially independent. Emphasis OPTION! One option out of many other options. Here’s a long list of things to do once you’re financially independent. For me, it’s not “going back”. It’s going forward. This was a chance to try something I’ve wanted to try for a long time and I was lucky to get it. Take it from someone who waited till 55, accumulated the 7 figure retirement account, after thinking it over for the last 8 years I am really upset that I did not make the move earlier. I never once didn’t earn enough to cover all my expences every year(post retirement) and in fact in most years since then I have increased the principle. Those years of missed opportunity can never be retrived. Did I mention that retiremet has been the most enjoyable experience of my adult life. My advise is be ready to gamble a bit you never know what the future holds. I have friends like that. Even if they won the lottery (a small amount, enough to retire, but not enough to live like a jetsetting socialite), they’d still be working because they literally can’t think of anything else to do. It’s not really about passion – it’s more about the fact they have no other interests outside work. I don’t think you can be passionate about most types of work. I’ve never met anyone who was obsessed with a accounting or cleaning hotel rooms (unless they were running their own business). Maybe if you worked in a field like medicine, law enforcement or social work, where there are bigger factors than the work itself (ie. justice, helping people etc). As I approach early retirement I’m a little bit worried about comfort. I love comfort but often comfort has not loved me back. As I look back on my life sometimes I was sometimes happiest when I was stressed out and super busy. And when I was most comfortable I was, well kind of lazy, not particularly useful for anything, and just generally weak all around. So I’m going to pick up a regimen which will induce a little bit of stress across the board mentally, spiritually, and emotionally just to keep sharp. It’s completely outside our realm of thinking and difficult for us to imagine, but for many (most) of the people I work with who say they want a “comfortable retirement” mean they want enough money to buy whatever they want, however much they want, whenever they want, for however long they want. Which, in fact, for them means a bottomless well of cash. Judging from their near ZERO savings/investment levels, this is an impossibility. I’m afraid they’ll all die without having their full greed potentially realized. I have to say for me I am going to jump out as soon as I can get by with bare minimum and that’s about 6-7 k € per year. Were pretty lucky here in Finland to have free education and “free” healthcare and on top of that a minimum retirement after age 65(about 700-800€/mnth) so the worst thing that could happen is that I might have to work now and then? Maybe…Or then just pick bottles from the street and recycle and get cash from that(sounds like HoBo but i’m fond of the idea). There are companies which pay pretty high dividends and I’m not that concerned with risks so I think my number is somewhere between 80-90k. The Stoics regularly warned about the dangers of “comfort”. It is when we are most comfortable that we are least productive. The mindset we embody as investors seeking early financial independence is one of squirrels. We busily sock away what we need for the future. We are constantly preparing ourselves against changes in the weather. We are at our best when we are working away to solidify our foundations. I believe what most of us are after is not necessarily “comfort” or even “relaxation”, but really the ability to choose what we are busy working away at. Life satisfaction begins and ends within. How we relate to the world is what will determine that. New trucks, fancy vacations, they come and go. At the end of the day, we all look into the mirror and how one feels can’t be faked. Here’s to hoping everyone on this journey finds true happiness!